"Star Wars" fans are salivating over the new full-length trailer for "Rogue One"—the latest installment in the blockbuster sci-fi saga. Besides the return of Darth Vader and some tantalizing clues to long unanswered questions in the series, the clip offers something else striking: unprecedented diversity. Not only is "Rogue One" continuing "The Force Awakens" trend of putting a young woman in the center of the action, but it appears to provide prominent roles for African-American, Latino and Asian actors as well—a relatively new development in the "Star Wars" universe. NBC News reached out to LucasFilm for comment on the casting choices, but have not heard back at this time. The original "Star Wars" films were knocked for initially having no characters of color, and then eventually featuring only one prominently—Lando Calrissian played memorably by Billy Dee Williams—although legendary black actor James Earl Jones did provide the iconic voice for Vader (and continues to). The polarizing prequel films, which came more than a decade later, were eviscerated by some critics for their perceived cultural insensitivity, when computer-animated characters like Jar Jar Binks, were widely viewed as trafficking in uncomfortable, old-fashioned racial stereotypes. “Whether intentionally or not, Jar Jar’s pratfalls and high jinks borrow heavily from the genre of minstrelsy. Despite the amphibian get-up, his relentless, panicky, manchild-like idiocy is imported directly from the days of ‘Amos ‘N’ Andy’," The Nation’s Patricia Williams wrote about the character in 1999 following the release of "The Phantom Menace." "[W]hether it were a white man, a black woman or Al Jolson himself beneath the mask, what would still make all the clowning so particularly insulting is the fact that Jar Jar’s speech is a weird pidgin mush of West African, Caribbean and African-American linguistic styles,” Williams said. Last year's "The Force Awakens," the first "Star Wars" film in 10 years and the only one to have very little involvement from series mastermind George Lucas, appeared to make a deliberate effort to break with the past. Along with putting a female with feminist inclinations in the lead, producers cast John Boyega, a black actor, as her co-lead. Despite some backlash from fringe elements on the Internet, the pairing was well-received by critics and audiences. The film's box office performance was unparalleled. Today, "The Force Awakens" ranks at the all-time highest grossing film in America (not adjusted for inflation) with a nearly $200 million lead on the next closet film. Still, if you thought the "Star Wars" films couldn't stand to make more money you're mistaken. Despite its record-breaking performance stateside, the consensus within the industry is that "The Force Awakens" under-performed abroad. This wasn't an indictment of the quality of the film (some critics believed the film merited serious consideration for a Best Picture Academy Award), but a diminished brand awareness in countries like China and India. Although "Star Wars" is indisputably a cultural institution here in the United States, the previous six films (which now date back nearly 40 years) had been banned in China until fairly recently. Some might speculate that the movies' emphasis on themes of freedom from tyranny may have been a factor, but in reality all Western movies had been embargoed until a quota system was installed in the mid-1990s, allowing just 10 American films a year to be screened for audiences there. 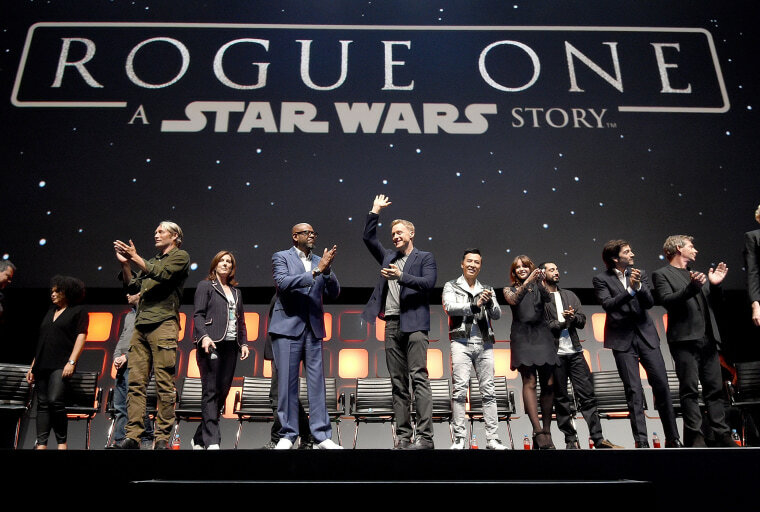 Today, Asia is one of the most important markets for American films, and while "The Force Awakens" did find a sizable audience there, the casting of A-list Chinese actors Donnie Yen and Jiang Wen in "Rogue One" will almost certainly broaden the movie's appeal in their native country and elsewhere around the globe. But the diverse casting of "Rogue One" could also prove beneficial in ways that go beyond its bottom line. "I think domestic audiences have made their voices heard that they're looking for more diversity in big films as well. 'The Force Awakens' did a great job in incorporating Daisy Ridley and John Boyega as leads in relaunching the franchise last year, I'm happy to see that continue with this film," Daniel Loria, managing editor of Pro.BoxOffice.com told NBC News on Friday. "Rogue One" appears to have already broken the mold and their move will likely pay off. A March diversity report from UCLA determined that films with at least a 41-50 percent non-white cast perform better in the global marketplace, which runs counter to long-held prejudices that international audiences weren't interested in films starring black and brown performers. Still, when it comes to "Star Wars"—which has arguably the most rabid and devoted fanbase in cinema history—any new entry is likely to be a hit (every original canon release has grossed at least $200 million domestic), no matter what the reviews are and who the star is. "Rogue One," which takes place chronologically between the final prequel and the classic 1977 original, will be selling nostalgia and familiarity when it opens across the U.S. this December. But it may translate better to the rest of the world for what is fresh about it, namely its perpetuation of a truly multicultural galaxy.